Across Roborough Down Cap cloud could be seen and with the forecast easterly wind there was hope of possible wave. This was born out with the early arrivals of Richard Roberts and Roger Green to rig their slick glass machines. Other Wednesday soarers slowly arrived and we got the airfield ready for flying. During the DI of HXP it was noticed that the tyre pressure was low. 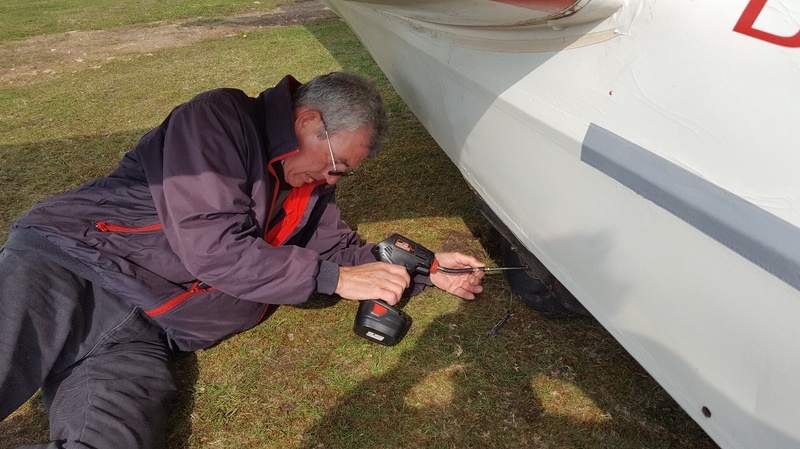 This was soon rectified by Martin Cropper after borrowing a hand held compressor from Steve Fletcher. 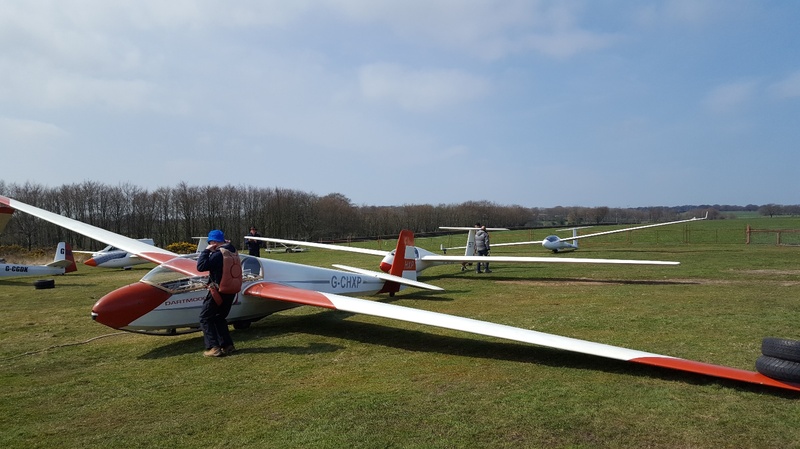 The grid slowly assembled with a club K8 & k13, Astir (Phil Hardwick), Open Cirrus (Steve Fletcher), Discus (Richard Roberts), ASW20 (Roger Green) and K6 (Colin Boyd). First in the K13 with me was Hugh Gasgoyne. 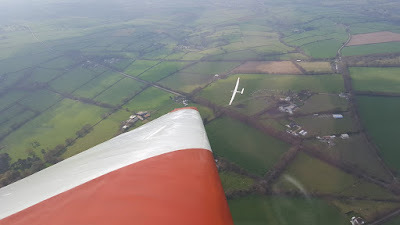 His second flight was his first soaring flight since returning to flying. This had him whooping in the front seat as we climbed to 1700’. The height was not wasted as we used it for a couple spin recoveries and also stall recoveries. After a second set of three flights later in the day including eventuality practices, Hugh re-soloed. Well done Hugh. 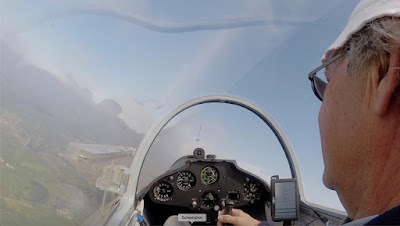 Bob Samson also occupied the front seat with myself and later Martin Cropper in the back seat to continue his progress to hopefully resolo in the near future. The aircraft waiting at the launch point. We stacked the K13 for a short while to enable the privateers to launch. Malcolm (K8), Steve, Richard and Roger all launched and managed to get away. So the K13 was pulled forward for Hugh to have his second set of flights. The circuit became very busy with all the solo pilots returning at the same time and Hugh coped well with the extra traffic. The airfield looked like the flight deck of Queen Elizabeth with aircraft scattered all over. After retrieving all aircraft, normal service was resumed. Steve Fletcher’s view near cloudbase. 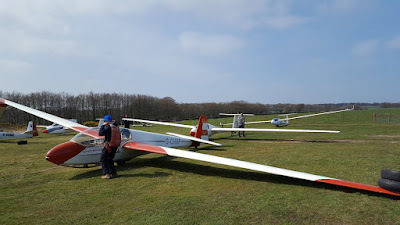 Flights of the day were Richard Roberts 2:00, Roger Green 1:40, Alan Holland 1:00, Malcolm Wilton-Jones 1:00, Steve Fletcher 0:54 and Phil Hardwick 0:46. With few trainees and a second instructor available I even managed to climb into the K8 for 1:02.